(Release Date: August 25, 2015)  When President of the United States William Alan Moore (Samuel L. Jackson) narrowly evades an assassination attempt while aboard Air Force One, he and his escape pod safely land in the remote Finnish wilderness. With crooked Secret Service agent Morris (Ray Stevenson) and a gang of old-fashioned psychopaths (led by Mehmet Kurtulus) hot on his trail, Moore must rely on Oskari (Onni Tommila), a bow-and-arrow-sporting 13-year-old boy on a rite-of-passage mission, to guide him back to civilization. "Big Game" was lensed by cinematographer Mika Orasmaa with a rustic, outdoorsy beauty, and its every majestic vista comes through in its 1080p digital transfer with crystal-clear clarity and depth. Colors are bold yet realistic, while detail is excellent straight down to facial features, faraway mountain peaks, and stitches of fabric. The image is far from flat, finding arresting dimensionality in just about every shot. Technical anomalies are all but nonexistent; I detected no signs of moiré, shimmer, banding or edge enhancement. The Dolby TrueHD 5.1 Master Audio is largely satisfying as well, delivered with the oomph and immersion one expects from a modern big-screen action pic. The home-theater soundfield comes alive in scenes such as the President's high-flying escape from Air Force One. Dialogue and fidelity are top-notch as well. If there is a disappointment to be had, it is with the disc's unrated version, oddly coming with an inferior 2.0 track rather than the 5.1 presentation of the theatrical cut. Since the running-time difference is negligible between the two, one has to wonder why there had to be an audio downgrade for this particular version. 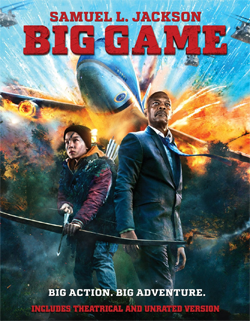 "Big Game" not only survives its crash-landing to Blu-ray, but impresses mightily in terms of its high-definition picture and 5.1 audio showcases. The dearth of bonus content is a debit, but otherwise Anchor Bay Entertainment's release should please fans and win over new ones who missed it during its too-small theatrical run. Recommended.